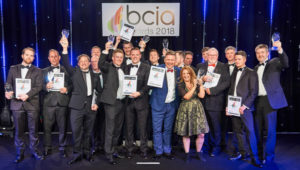 The winners of the 2018 Building Controls Industry Association (BCIA) Awards were announced at the prestigious ceremony and gala dinner on 10 May at the Hilton Metropole Birmingham. Multi award-winning Lucy Posted hosted this year’s awards which celebrated the crème de la crème of the building controls sector and recognised outstanding people, products, training and innovation. Chartwell Controls claimed the first accolade on the night for Independent Building Controls & BEMS Installer of the Year as a result of their professionalism, innovative problem-solving and customer satisfaction. Next up was the Engineer of the Year Award which was presented to Miles Moss of Detail Design Engineering for his outstanding customer service skills and willingness to go the extra mile. Greg Smith of E.ON Control Solutions clinched the Young Engineer of the Year Award after demonstrating his application of knowledge, great communication skills and successful building controls achievements during his apprenticeship. Additionally, E.ON Control Solutions claimed the Best Service & Maintenance Provider Award for exceeding client objectives and raising the bar for the level of support they provide. Portal Building Controls scooped the Energy Management Award for the London School of Economics energy refit which as a result of their involvement is achieving upwards of £230,000 per annum in energy savings. The Technical Innovation of the Year – Products Award was won by Global Associates for their innovative product, global spaces, which interfaces clients’ room booking and reservation systems within the BEMS environment. Demand Logic clinched the Technical Innovation of the Year – Projects Award following installation of their Data Acquisition Device (DAD) at 155 Moorgate which identified projected savings of £25,000 per year, while One Sightsolutions Ltd won the Contribution to Training Award for their first-class service and professional training facilities.